JEFFERSON CITY, Tenn. – It will go down as a 1-1 tie but the Lee University Lady Flames were eliminated on penalty kicks (3-1) on Friday afternoon in the Sweet 16 of the NCAA Division II National Tournament hosted by Carson-Newman University. It was a heart-breaking elimination for the women’s soccer team who finished the outstanding season with an official 17-4-2 record. Gulf South Conference rival University of West Florida advanced to the Final 8 with the PK decision. The Lady Flames came out blazing hot and quickly gained a 1-0 lead at the 11:32 mark on an unassisted goal by Summer Lanter. As several shots did in the first 20 minutes, Lanter’s score came after the ball pinged around off the corner kick. It was the 20th goal of the season for the All-Region player of the year and put Lee in command for the majority of the match. The Lady Flames out-shot West Florida 15-6 in the opening 45 minutes but the Argos came back and had 13 shots to only five for Lee in the second half. In the two overtimes, Lee attempted three shots to none for the Argos. Lady Flame keeper Haley Gribler finished her career with seven saves, while Argo goalkeeper Katelyn Burkhart registered nine saves. Lee was awarded 11 corner kicks to just four for West Florida. Eight of the corners came in the first 45 minutes. The Argonauts evened the hard-fought battle with only 5:10 remaining when Shantell Thompson was awarded a penalty kick after the referee called a foul on the Lady Flames inside the box. Lee head coach Chris Hennessey did admit that he thought the penalty call in the box “was a soft foul” in what was an extremely hard-fought contest for 110 minutes. The two rivals went head-to-head for the remainder of regulation and two 10 minute overtime periods. The Argos quickly jumped on top in the PKs as Thompson drilled home the kick and put the extra pressure on the Lady Flames when UWF keeper Burkhart turned away Lee’s first attempt. 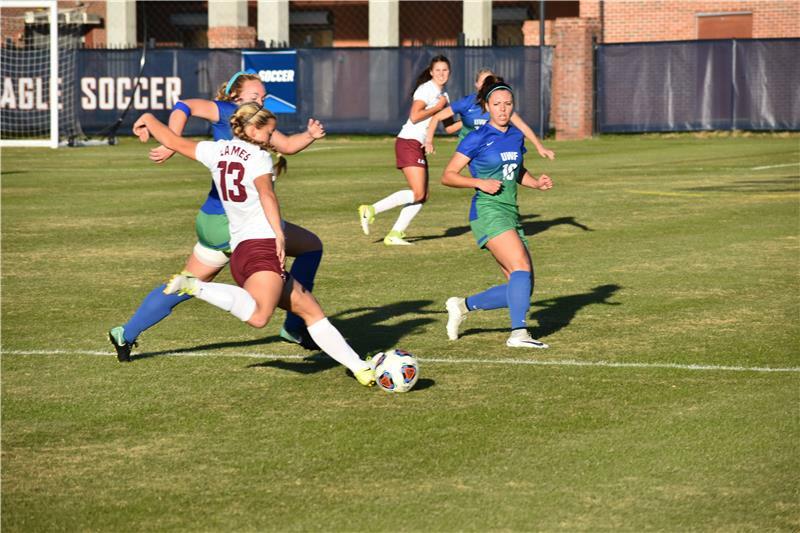 West Florida went on to nail two more PKs, while the Lady Flames could only put one into the back of the net.